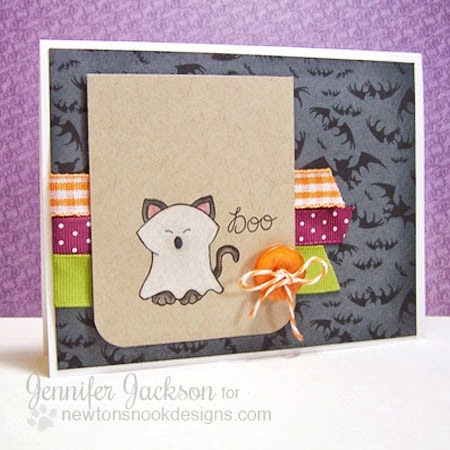 Newton's Nook Designs: Boo Kitty! Today I'm sharing a simple and sweet card I created using the kitty and "boo" sentiment from the Boo Crew stamp set. 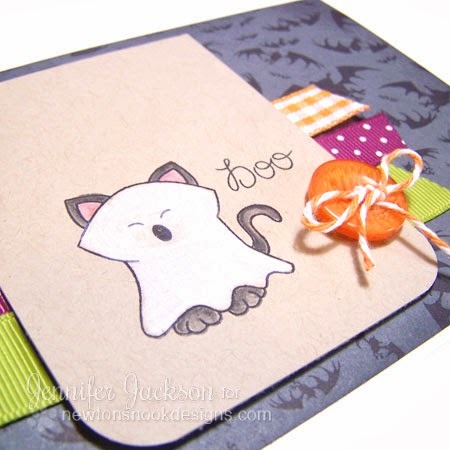 I stamped the kitty on the kraft cardstock and colored him with colored pencils - isn't it cute how the white stands out on the kraft paper? Then I simply layered it over some printed bat paper and bright colored ribbons! I really love how those bright ribbons contrast against the neutral colors. I also added an orange button for some extra interest. I just love how this turned out! So much fun, don't you think? Yes, your card and that cute kitty are fun! I'll echo you: love how this turned out! I haven't coloured on kraft in 'forever' - you've given me, yet again, some fabulous inspiration!! Thank you!